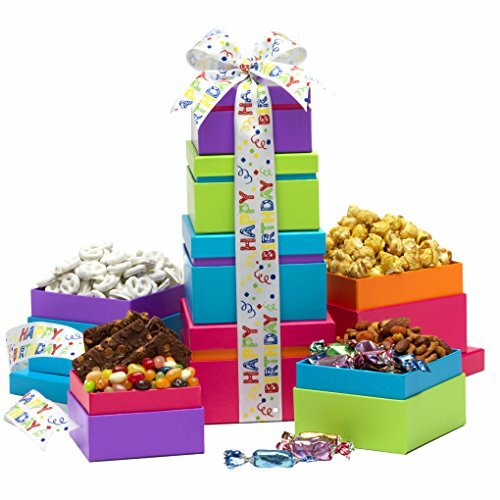 Birthday Gourmet Snack Gift Box Tower offers a Sweet Selection of Six Snacks including: Assorted Flavored Jelly Bellies, Brownie Brittle-Salted Caramel, Sweet & Savory Snack Mix, Gourmet Caramel Popcorn, Assorted Milk Toffees, and Yogurt Covered Pretzels. Tasteful Reusable Packaging - This stacked tower of birthday gift boxes are beautifully filled to the brim with delightful snacks and offers a beautiful display at your celebration. Perfectly created to be the ideal gift idea for every occasion and every taste. Perfect as a unique birthday gift box idea for any age, for men, for women, for boys and for girls. Everyone can enjoy this gourmet kosher edible gift arrangement. Gift Tray Dimensions - 5 in. x 5 in. x 13 in. (total stacked height) This unique birthday gift idea is an attractive addition to any occasion and can stand on its own without taking the spotlight from the recipient's special day. Personalized Birthday Messages are also available to share your customized birthday wishes for every situation that can arise. This heart-warming option has been included to allow you to share your custom created message with your gift recipient.